Ranui Baillie, a first-year house surgeon at Palmerston North Hospital, and Lucy Sulzberger, a final year University of Otago medical student, are two such people. Remarkably, both have already achieved breakthrough research findings that have been recognised worldwide and published in prestigious international medical journals. Ranui (27) and Lucy (24) credit a significant part of their early career success to their stints as summer students at the GMRI, working under the guidance of Chief Scientific Officer Dr Tinte Itinteang and Executive Director Dr Swee Tan. 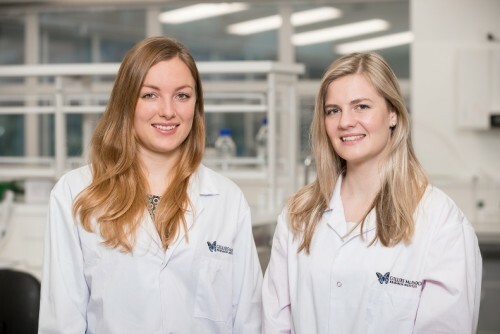 Ranui and Lucy studied together at the GMRI in 2014/2015, each completing two summer studentships and a year of full-time research in the laboratory. While there, Lucy completed a thesis that explores the make-up of strawberry birthmarks and the activity of a particular signalling pathway involved in stem cells derived from birthmarks that transform into red blood cells. Her work has been submitted for publication in an international journal. Ranui’s thesis, completed during the year between her two summer studentships, focused on the role of cancer stem cells within tongue cancer. This followed a previous international research breakthrough where she was responsible for identifying and characterising a unique population of cancer stem cells in tongue cancer. The GMRI has filed an international patent registration covering her work. Her paper ‘Cancer Stem Cells in Moderately Differentiated Oral Tongue Squamous Cell Carcinoma’ was published in the Journal of Clinical Pathology. Ranui has recently submitted an article titled ‘Cancer Stem Cells in Oral Cavity Squamous Cell Carcinoma’ to Frontiers in Cell and Developmental Biology. Lucy and Ranui also co-authored a paper titled ‘Serum Levels of Renin, Angiotensin Converting Enzyme and Angiotensin II in Patients Treated by Surgical Excision, Propranolol and Captopril for Problematic Proliferating Infantile Haemangioma’. This was published in the Journal for Plastic, Reconstructive and Aesthetic Surgery. Their achievements have greatly impressed Lady Gillian Deane and Sir Roderick Deane, who have supported the GMRI summer student programme for four years through their Deane Endowment Trust. Lucy and Ranui began their medical studies at the University of Otago in Dunedin, but they both enjoyed the GMRI’s summer student programme so much they opted to stay on for a full year at the GMRI, working towards a Bachelor of Medical Science (Hons) degree. Both returned to the University of Otago’s Wellington Campus to complete their clinically-based training. They agree that the time spent at the GMRI has boosted their career prospects. Lucy is in her final year of medical school. She expects to graduate this year with a Bachelor of Medicine and Bachelor of Surgery degree in addition to her Bachelor of Medical Science (Hons) degree. “It is incredible being involved in health care in the place in which you grew up. I’ve come to have a better understanding of my own city and how other people live here, as well as the challenges and joys they experience. Although she no longer spends time at the GMRI, Lucy still sees Dr Tan around the corridors of Wellington Regional Hospital. Ranui moved to Dunedin from Western Australia nine years ago to attend medical school. After six years in Dunedin she moved to Wellington to start her first round of study at the GMRI in 2013. She graduated with a Bachelor of Medicine and Bachelor of Surgery degree at the end of last year, in addition to her Bachelor of Medical Science (Hons) degree. Ranui took up a position as a house officer at Palmerston North Hospital at the end of 2016. She hopes to work as a plastic surgeon one day, emulating Dr Tan. While Ranui plans to stay in Palmerston North to complete her medical council registration, she is interested in moving back to Wellington to get experience in a bigger city hospital.